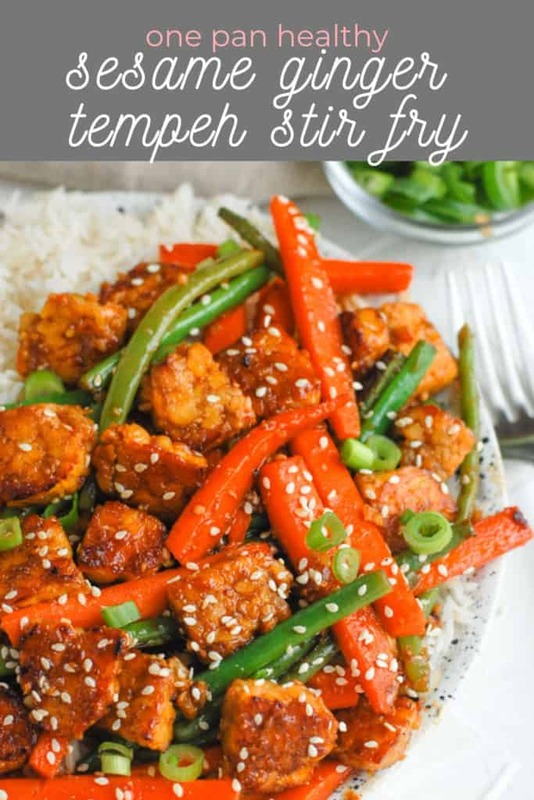 An easy dinner recipe for sesame ginger tempeh stir fry marinade, with steps on how to cook it, what it is, and access to my other favorite tempeh recipes like bbq, tacos, and spicy peanut! There are so many questions surrounding one of my favorite protein sources, tempeh. What is tempeh? How do you cook tempeh? 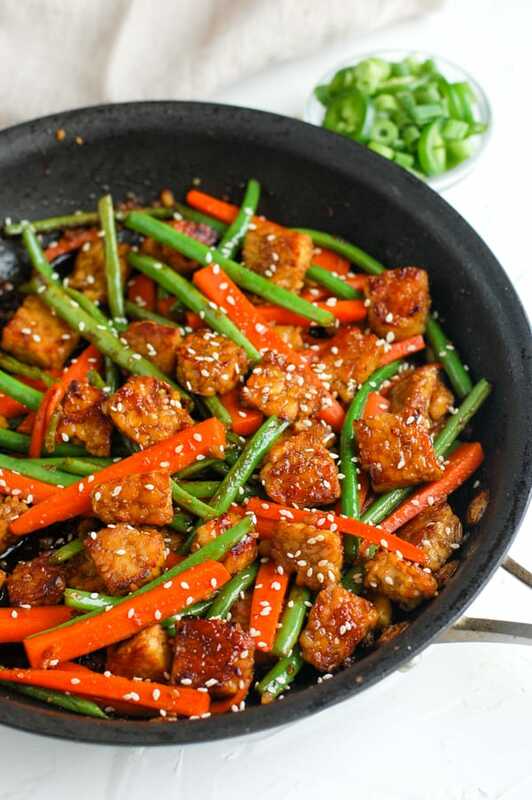 Is tempeh similar to tofu? Where can I find tempeh? Well, I’m here to answer your questions and provide you with a tasty and easy way to cook tempeh. You’ll walk away feeling confident in your cooking of this unique protein source that doesn’t nearly get enough love! Over the next week, I’m going to be sharing a bunch of tempeh recipes that will blow you away and make you realize what a versatile protein source it can be. Plus, I will also help show you just how easy tempeh is to make and prepare! It can be as easy as preparing a marinade and baking it, to pan frying it with your favorite homemade sauce. 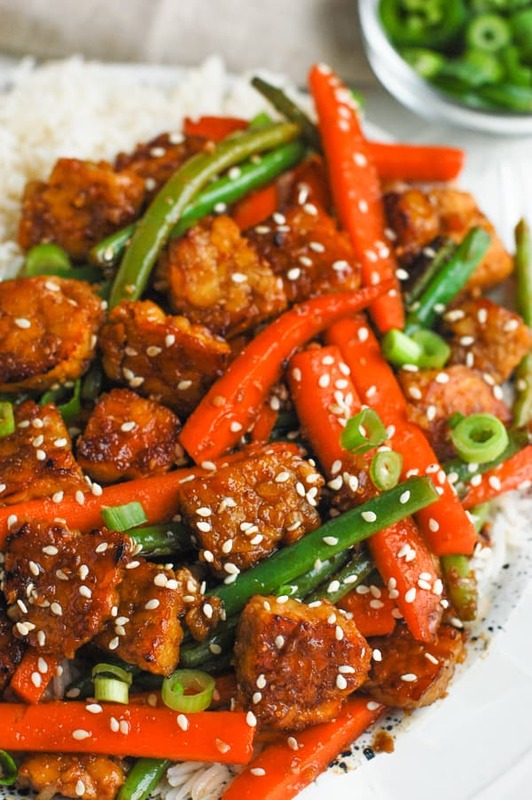 Tempeh is a soy-based product, like tofu, however the two have totally different textures and flavors. Tempeh is made by fermenting soybeans and forming them into a dense loaf. The soybeans are often mixed with small amounts of other grains and legumes to add more texture, like rice and beans. My favorite brand (the one from Trader Joe’s!) is made up of soybeans, millet, barley and brown rice. The taste is nuttier and heartier than tofu, and it holds sauces and marinades really nicely in all of the grooves. If you’re interested in learning even more about tempeh, be sure to visit this post where I break down all the information about it! 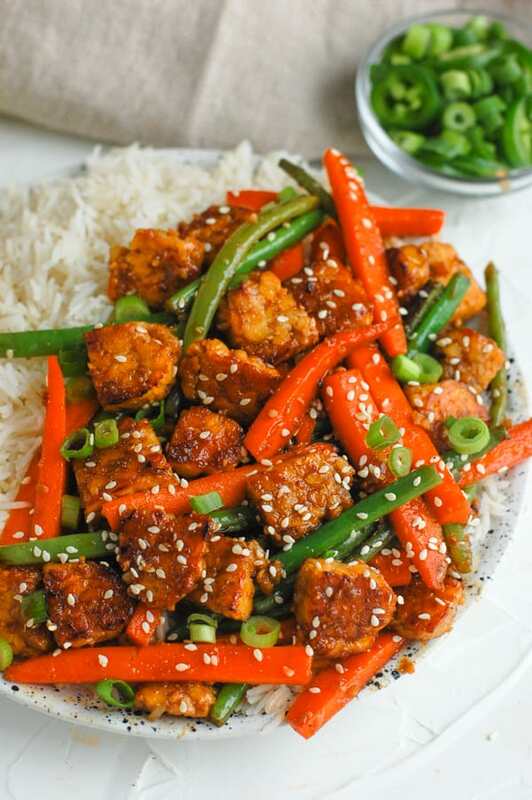 One of my first ever favorite recipes for tempeh was making it into a stir-fry with an Asian sauce, and from there, I’ve made so many delicious marinades and sauces for tempeh, plus with different ways to prepare it. 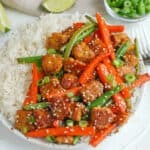 This easy Asian sesame ginger tempeh stir fry is one of my favorite ways to get people more involved in eating tempeh. I truly believe it’s all about how you cook and prepare it in order to get people on board with it. For this recipe, there is no marinade time so you can whip it up in a matter of minutes! We’re going to pan-fry it for this recipe, but my other tempeh recipes use a variety of cooking methods. I always start by steaming my tempeh to remove any extra bitterness, which I explain all about in this post. In this tempeh recipe, you will need one 8oz block of tempeh, veggie of choice (I used green beans and carrots! ), and ingredients for the sauce. The sauce is made up of fresh ginger, fresh garlic, sesame oil, rice wine vinegar, soy sauce, maple syrup, sesame seeds. 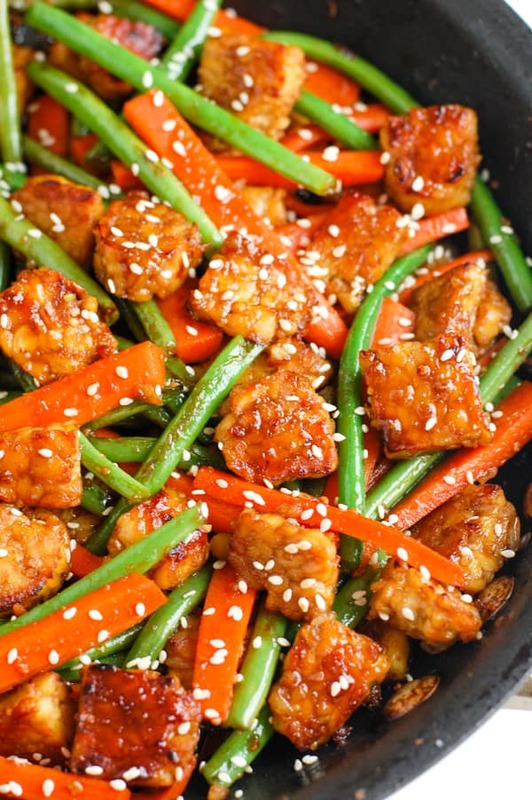 It’s as simple as whisking together the sauce, pan frying the veggies and tempeh, adding the sauce and serving! We love to serve this over some white basmati rice. 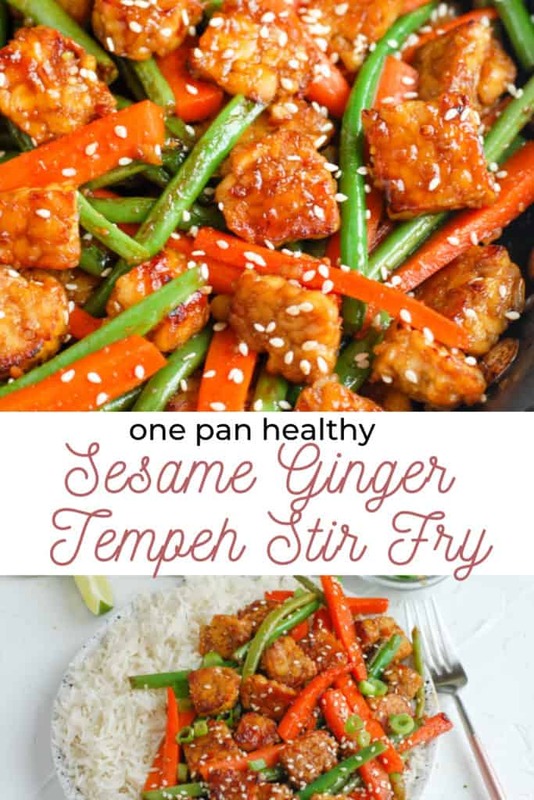 An easy dinner recipe for sesame ginger tempeh stir fry, with steps on how to cook it, what it is, and access to my other favorite tempeh recipes like bbq, tacos, and spicy peanut! Slice tempeh into cubes, about 1/4 inch thick. Heat a pan with 2 tbsp olive oil and add tempeh once hot. Cook tempeh about 6 minutes, flipping occasionally until slightly browned on each side. Whisk ginger, garlic, sesame oil, rice wine vinegar, soy sauce, and maple syrup together in a bowl. Add in half the sauce to the pan with the tempeh until coated. Remove tempeh from pan and place in bowl. Add veggies and remaining sauce to pan and cook for about 5 minutes, or until veggies have started to soften. You can stir throughout this time for even cooking. Add tempeh back into pan and cook for an additional 3-5 minutes or until veggies are all cooked through. Serve with white basmati rice or starch of choice!